Willgodt Theophil Odhner (1845-1905) from Karlstad, Sweden designed his first hand-cranked calculating machine in 1874. The first Facit calculator was an Odhner-type pinwheel machine made in 1918 by the firm Axel Wibel in Stockholm. In 1924 Wibel was taken over by Atvidaberg Industries who adopted the name Atvidaberg-Facit, Sweden. But it was not until 1957 that they started using the name Facit on its typewriters. This information is taken from Christofer Noring's Swedish web site ( Swedish Typewriter Page) dealing with early typewriters and calculators. Please refer to Christofer's site for a great deal more on Facit. Christofer's History of Facit Calculators also appears on James Redin's web site ( X Number World of Calculators). Photos of Facit calculators and other data can be found at Nigel Tout's Vintage Calculators site. 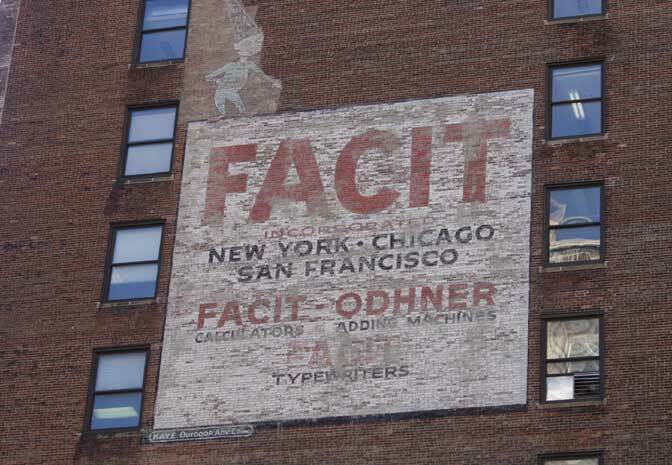 Facit Adding Calculators was established in New York in 1935 (probably as the USA affiliate of Atvidaberg-Facit, Sweden). They became known as Facit, Inc. in the mid-1950s, which is when they moved their New York offices to this address (called 404 Fourth Ave. at the time). The sign likely dates to that time. In the early 1960s Facit moved their offices to East 42nd St. and their service department to West 51st St. In 1972 Facit was taken over by Electrolux.